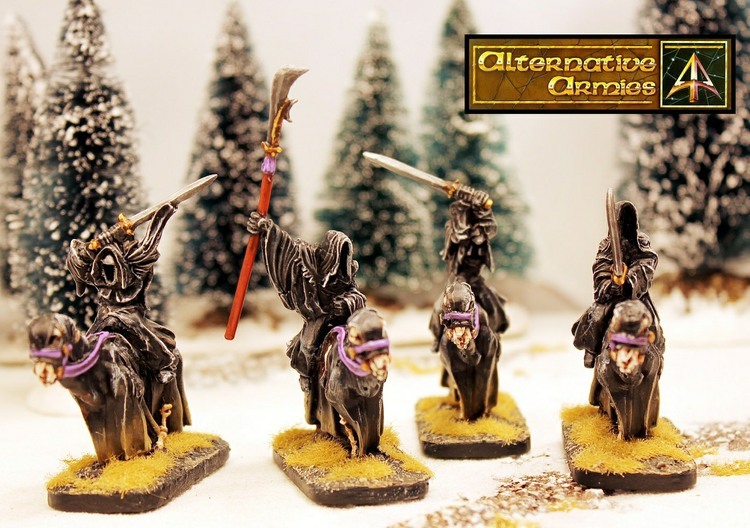 Alternative Armies is delighted to release into our VNT High Fantasy 28mm range three new packs of Undead great for any game system. 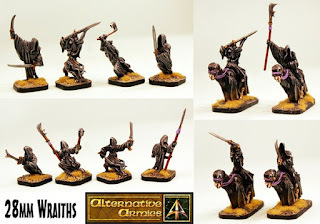 See the Undead Legions range HERE or read on for more information about our new Wraiths which are totally compatible for our classic VNT28 Wraiths pack which is very popular. I have always loved these creatures since I was a lad reading books about them. This code contains four different white metal miniatures approx 28mm average height. Poses in this code are as follows: Wraith with two Swords, Wraith with two handed Sword, Wraith with Axe and Wraith gliding forward with Sword. You can choose from a pack of miniatures or single poses or three packs with an extra saving all on website page. Supplied Unassembled and Unpainted with no bases. We recommend our 25mm square cartouche resin bases. Go HERE. 8.00GBP per pack. 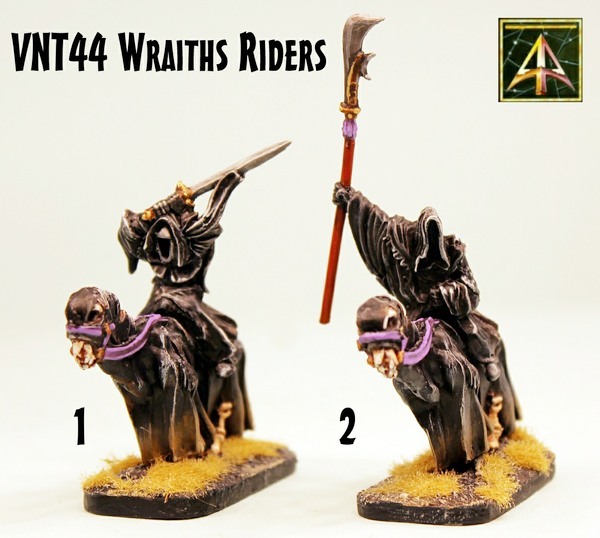 This code contains four different white metal miniatures approx 28mm average height. 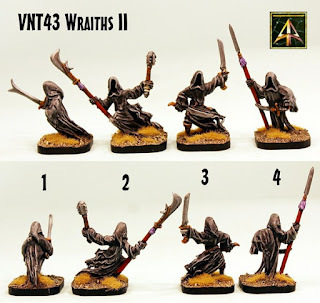 Poses in this code are as follows: Wraith with Snake Tongue Sword, Wraith with Polearm and Mace, Wraith with twin Swords and Wraith with Spear and Long Dagger. You can choose from a pack of miniatures or single poses or three packs with an extra saving all on website page. Supplied Unassembled and Unpainted with no bases. We recommend our 25mm square cartouche resin bases. Go HERE. 8.00GBP per pack. This code contains two different mounted white metal and grey tone resin miniatures in 28mm scale. Poses in this code are as follows: Wraith with two hands Sword overhead sitting on a skeletal horse which has a separate saddle roll. Wraith with Polearm raised sitting on a skeletal horse which has a separate saddle roll. You can choose from a pack of miniatures or single poses or three packs with an extra saving all on website page. Supplied Unassembled and Unpainted with no bases. We recommend our 25mm by 50mm rectangle cartouche resin bases. Go HERE. 8.00GBP per pack. 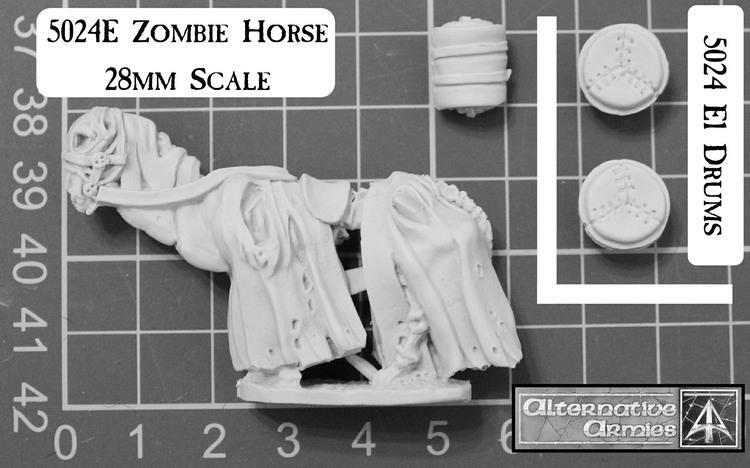 This code contains two different mounted white metal and grey tone resin miniatures in 28mm scale. Poses in this code are as follows: Wraith with Great Sword overhead sitting on a skeletal horse which has a separate saddle roll. 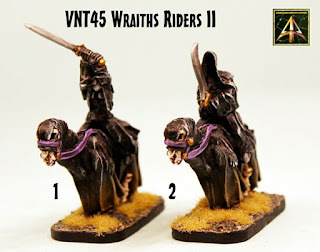 Wraith with Sword sitting on a skeletal horse which has a separate saddle roll. You can choose from a pack of miniatures or single poses or three packs with an extra saving all on website page. Supplied Unassembled and Unpainted with no bases. We recommend our 25mm by 50mm rectangle cartouche resin bases. Go HERE. 8.00GBP per pack. 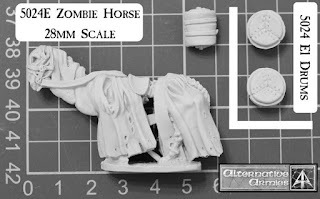 This pack contains one 28mm scale resin Zombie Horse taken from 5024 Escape the Dark Czar sets and also used in 55517 Spektrov Curiassiers and our VNT Fantasy Wraiths. It will fit most 28mm riders and comes with a separate saddle roll. You can select this option or the 'E1' option which also comes with two Kettle Drums as shown for a musician. Go HERE. 2.00GBP. 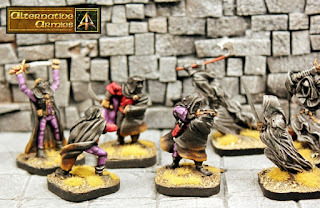 Some in game photos (from our system DarkeStorme) of the Wraiths including a vicious fight with Guild Assassins! 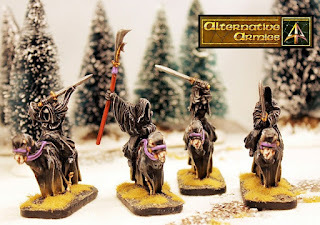 The darkness descends upon the land with the arrival of the silent Wraiths! 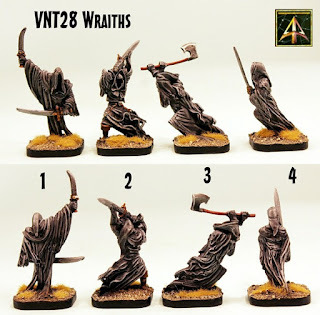 If you liked our VNT Range then you might want to check out other 28mm fantasy ranges we have. Click on the links to visit these ranges to see what we have.